We tend to get overly focused on bacteria that are trying to kill us (and there’s no shortage of those), but there are large populations of bacteria that live in or on us without causing any problems, and some of them are even helpful. This is especially true in the gut, where bacteria help us with the food we eat and provide some essential nutrients; there’s even evidence that our gut bacteria can influence our behavior. This creates a bit of a challenge for the immune system, which needs to kill harmful bacteria and avoid killing helpful ones—but still keep their numbers in check. This involves a degree of interaction between the immune system and the bacteria. A study in yesterday’s Science has described a new way that the gut and bacteria interact to keep things from getting out of hand. 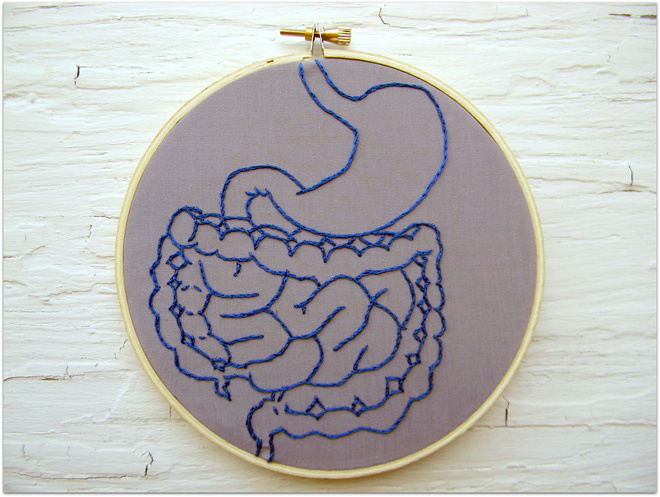 Cells in the gut sense when the bacteria get too close, and produce a peptide that kills some of them off when they do. This keeps the space around the cells of the small intestine free of bacteria, which in turn keeps the bacteria from setting off a full-blown immune response. The research started out with a fairly simple observation. The small intestine, which is covered in tiny, finger-like projections, does not have a physical barrier to prevent bacteria from reaching it. But the bacteria don’t manage to get in between the fingers; in fact, as the image below shows, they’re generally kept a safe distance away from the surface. The researchers reasoned that something must be recognizing all the bacteria, not simply specific species, in order to manage that sort of ordering. So they focused on the innate immune system (which recently earned two people a Nobel Prize). This system has a few receptors that recognize features common to all bacteria, allowing it to respond to most of the ecosystem that lives in our guts. To test this hypothesis, the researchers knocked out the mouse version of a gene that encodes a protein that acts downstream in the signaling pathway triggered by these immune receptors. With the protein (MyD88, for the curious) gone, there was a large increase in the number of bacteria that ended up at the intestinal surface. With that hypothesis confirmed, the researchers turned to the question of how the innate immune system actually kept the bacteria away. To do this, they knocked the same gene out in specific cell types to determine which cells actually sensed the presence of nearby bacteria. With the cells identified, they looked into some of the antibacterial genes known to be expressed there. They settled on a protein called RegIII?, which can kill a broad spectrum of bacteria. It was expressed in the right cells, and knocking out the innate immune system led to a decrease in its expression. The authors knocked the gene for RegIII? out as well, and showed that the mice that lacked this protein also had bacteria growing near the surface of the intestine. So the innate immune system seems to act to keep the bacteria at a safe distance from the surface of the intestine, which probably helps limit infections. But it seems to have a second effect, one that’s good for both the bacteria and the host: it keeps the immune system from bringing out its big guns. In the RegIII? knockout animals, the surface of the intestine has much higher levels of antibody-producing cells and T cells. These are key players in the adaptive immune system, and suggest the mice mount a full-blown immune response when the bacteria start appearing at the intestinal surface. Thus, the bacteria and the innate immune system appear to cooperate to keep a full immune response from occurring. But the authors also note that the full story is even more complicated than this. The RegIII? protein is only effective against a subset of the bacteria that live in the gut (the gram-positive ones). But the innate immune system seems to keep all types of bacteria in check, suggesting there are other pathways that target different species. The team involved in this work is undoubtedly looking for those other pathways now.